Topics: Exclusive Cruise Packages, Shore Excursions, Group Planning, Exclusive Offers, and Alaska. 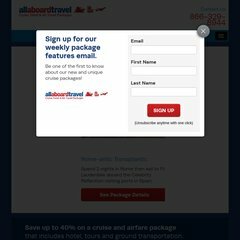 allaboardtravel.com Trans-Atlantic Cruise Package from Miami to London aboard Jewel of ..
On average 2.40 pages are viewed each, by the estimated 145 daily visitors. It is written for ASP.NET language. Its 2 nameservers are pdns02.domaincontrol.com, and pdns01.domaincontrol.com. PING (64.235.131.46) 56(84) bytes of data. A time of 51.1 ms, is recorded in a ping test, also its average full page load time is 3020 milliseconds. This is faster than 79% of websites globally.